There are several factors that I consider when picking a hostel to stay in: location, price, Hostel World rating, and whether they have wi-fi. That’s how I ended up booking a room at Mandalay Inn when I went to Siem Reap. Location and price are the two most important factor for me. I like to walk around new places, so I prefer staying at hostels that are close to the town or city center. I liked Mandalay’s location: it’s on a street just off the main road, and very near the old market. Mandalay Inn’s area is also mostly residential, so it’s a pretty quiet neighborhood. 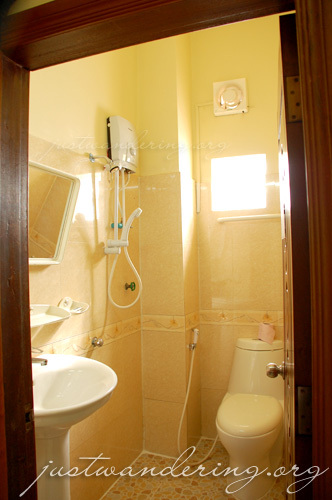 For US$7, I got a single fan room with ensuite toilet & bath and a cable TV. 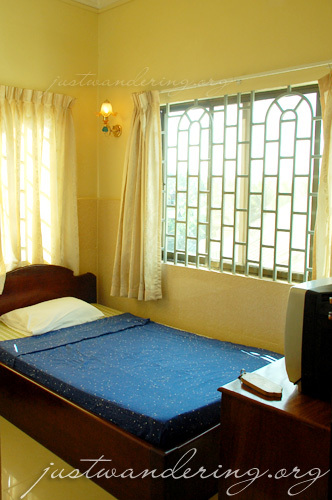 The room is not tiny; it can comfortably accommodate one traveler. My room was at the end of the hall on the 4th floor. It was a corner room, so I got two huge windows, which gave me plenty of natural light and ventilation. The toilet was likewise a decent sized toilet. Unfortunately, there wasn’t a partition between the toilet and the shower, so expect everything to get wet when you take a bath. The water pressure was okay, and though the plumbing was good, sometimes there’s a smell wafting up from the bowl. RELATED: What's in my bag? Wi-fi is available in most areas of the hostel, but it is strongest in the common room at the ground floor. At the 4th floor, the signal is fair. If you don’t have a laptop, you can use the desktop computers they have at the ground floor for the guests. It’s free to use, but if you’re using it at night, be sure to slap on some mosquito repellent. The staff at Mandalay Inn are hospitable. There’s always somebody you can approach if you need anything. The housekeeping staff are likewise always around, cleaning up rooms and the halls. 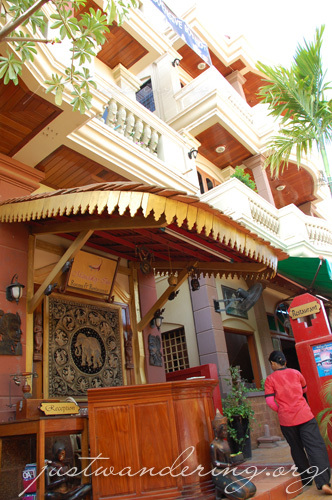 All in all, Mandalay Inn is a pretty good value accommodation in Siem Reap. I’d stay there again, but I’m also willing to try out other guesthouses. Im happy to have found ur blog, we are to vietnam in July and I would really like to go to Cambodia and visit the angkor wat. From what i googled, pwede bus from vietnam to cambodia. Thanks for all your post! More power! Hi there, thanks for the very useful information. I’ve been wanting/ planning to go on a solo trip but I just can’t do it yet, guess I’m still a little scared to travel alone. I’m actually looking at Cambodia as my first solo travel destination. During my trip to Siem Riep, I stayed at Siem Riep Hostel which I found in hostelworld. The price and amenities for a 7USD AC dorm room was unbeatable! Indoor swimming pool. Free internet. Complimentary bike to go around town + Angkor Complex. Small wonder the hostel was awarded by hostelworld as the best hostel there is! I will stay there again if I visit Siem Riep. RV: Yup, saw that nga on Hostelworld. Looks really nice, but I opted for a private room with all the stuff I carried around that time. How was the reservation process in Mandalay? You just emailed them and they confirmed the reservation and that’s it? Did you reconfirm your reservation when your trip was nearing? Yes, just e-mail them and they will reply to confirm your reservation, if they have available rooms.